The technical name for Spray Applied Fireproofing is Sprayed Fire-Resistant Material (SFRM). It is used as part of a building’s passive fireproofing strategy. 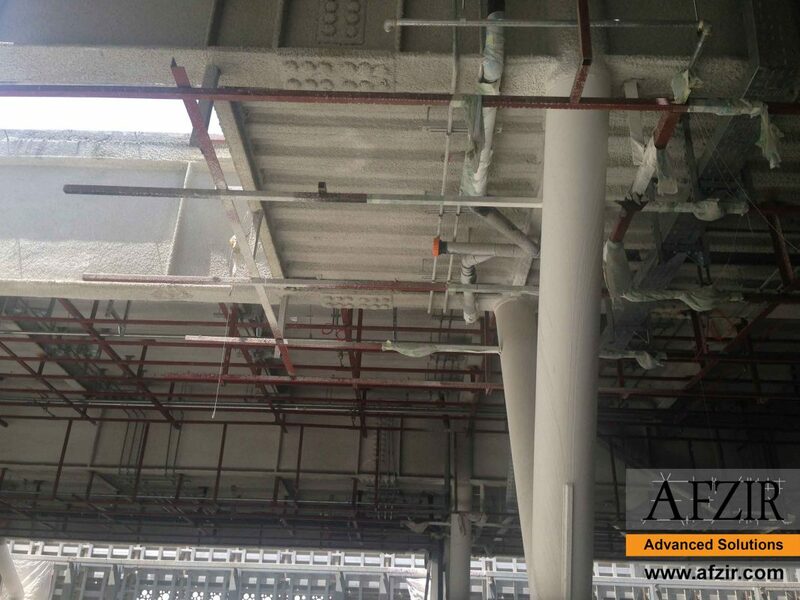 Spray applied fireproofing has thermal and acoustical properties and controls condensation. However, its main use is in insulating steel and metal decking from the high temperatures found during a fire. Low, standard, or commercial density (۱۵-۲۱ pcf) products contain gypsum as the binder. Low density SFRMs often provide higher yields and have faster coverage rates when compared with medium density products, which can reduce cost. However, low density products can flake away over time if they are exposed to contact from people, equipment, and even moving air so they should only be used when they are covered or protected. 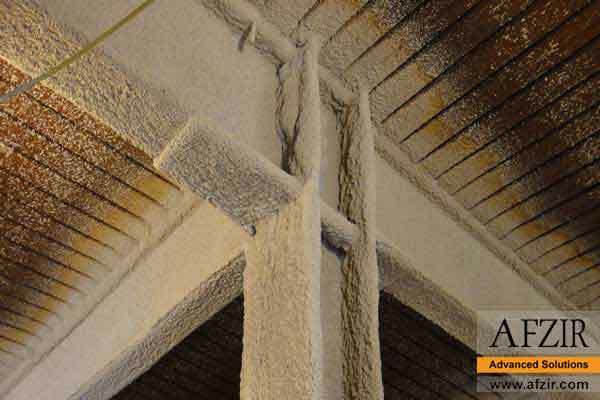 Medium density (۲۲-۳۹ pcf) fireproofing generally contains a binder made from cement or a mixture of gypsum and cement. This provides a much more stable product that can withstand air movement and minor bumps and scrapes. Medium density fireproofing can be used in an exposed condition, but shouldn’t be used where contact by humans or equipment is possible. Bond strength of spray applied fireproofing was spotlighted in the aftermath of the attacks on the World Trade Center in 2001. In this tragedy, the fireproofing was knocked off the steel columns and beams, which made them susceptible to the high temperatures of the fires that erupted. The US National Fireproofing Contractors Association (NFCA) NFCA100 Standard Practice for the Application of Spray-Applied Fire Resistant Materials (SFRMs) document provides guidelines for wet and dry SFRM types, preparation and application procedures, safety issues, and repair methods. 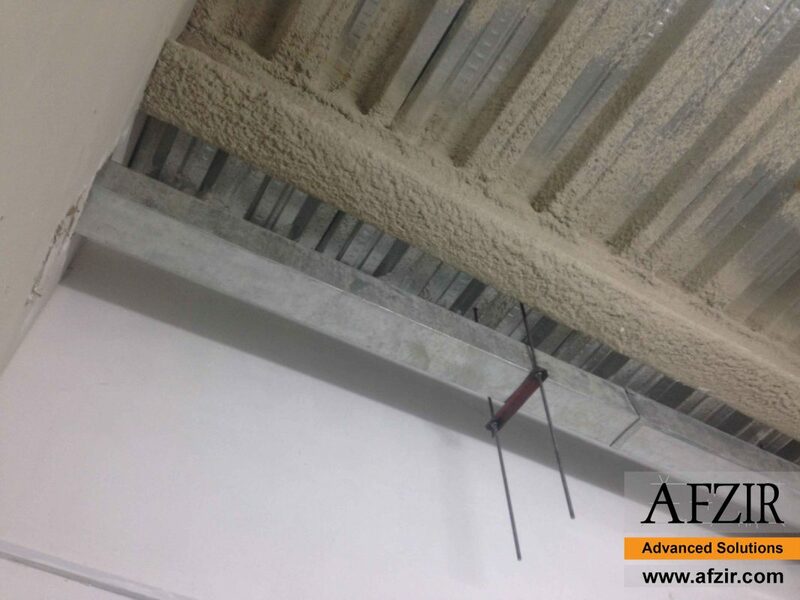 Here is some sample pictures from Afzir recent fireproofing projects using SFRM’s.